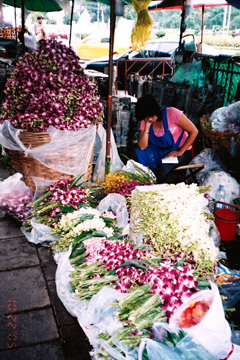 A flower market offers values on blooms. The kingdom of Thailand is the gateway to experience the best of Southeast Asia, offering cultural traditions, attractions and activities for a memorable trip. A major travel publication named Bangkok as the No. 1 tourist destination in all of Southeast Asia, followed by Hong Kong. This year is special in many ways for the kingdom because the year has been designated as "Grand Invitation Year" in honor of the 60th-anniversary celebration of His Majesty's accession to the throne. Next to the Buddha, King Bhumibol Adulyadej is the most revered person in Thailand, due in part to his tireless efforts for improving his subjects' lives. » When to visit: December and January, when the weather is cool. » Information: Available via the Royal Thai Consulate, 1270 Kalani St., Suite 103. Call 854-7332. » Tours: Several local travel agencies specialize in Thailand tours. Bestours, Regal Travel and R&C are a few offering great package tours. » Money exchange: Exchange rates are at a seven-year low, even for the greatly devalued U.S. dollar. Bring traveler's checks in $100 units to exchange in Thailand. Government banks near all hotels offer better exchange rates than the hotels. Rates change continuously, so always check for the best rates. Bring your passport when making these transactions. Always make extra copies of your passport, keeping copies in your various bags and hotel room safe. Try to get 20-, 40- or 100-baht currency as these are the most practical for tips, taxi and buying street goods. » Clothing: Bring lightweight and casual clothing and be sure you have comfortable walking shoes because sidewalks and tourist areas do not have good walking surfaces. Most eating places are very casual, with relaxed dress codes even in five-star hotels. » Health: If you become ill on your trip, don't hesitate to go to any government-run Thai Hospital. They are very good and do not charge an arm and leg. Employees offer excellent service and they speak English. Picking up travel insurance before you leave home is also recommended. » Domestic travels within Thailand: Book before you leave home because it will cost more if done in Thailand. Example: Round trip from Bangkok to Chiang Mai varies from $125 to $147. » Customs: You are allowed to bring back up to $800 per person. Goods made from crocodile, tiger skins and elephant tusks are prohibited by U.S. Customs and will be confiscated. The best time to visit Thailand would be the week of the king's birthday, which falls on Dec. 5 and is a national holiday during which the people and city are at their best. The following weekend, Chinatown hosts its three-day Food Safety Street Festival, during which main streets are closed to traffic from 6 p.m. to midnight and converted into a huge open cafe where tables and chairs fill the center of the streets and area restaurants and shops hawk a variety of goodies for both visitors and locals. What drives Thailand's economy are manufacturing, exports and, yes, tourism. Because Thailand has so much to offer, a one-week stay will not give you enough time to see and enjoy all Thailand offers. Many local travel agencies offer five-, seven- or nine-night tours, and I recommend the maximum on your first expedition. This way, you can also travel to Chiang Mai, the city most visited next to Bangkok, just an hour-long trip via Thai Airways. Chiang Mai is the hub of silk, teak, lacquer, leather, silver and wooden ornamental products, and many craft artisans can be found in this city, where the main attraction is its Night Bazaar, a center of shopping and eating. Getting to Thailand's capital of Bangkok, from Hawaii, is the secret to getting off to the right start. Traveling by China Airlines, you'll reach Taipei in 10-plus hours, with a short layover and another three hours in the air before reaching Thailand at about 4 p.m., enough time to enjoy a good dinner and night's rest before you start your explorations. All other major airlines arrive between 9:30 and 11:30 p.m. so by the time you clear Immigration and arrive at your hotel, you might find yourself exhausted the next morning. There are more than 6 million registered residents in Bangkok, but daily numbers, including tourists, are closer to 8 to 9 million. The Thailand Tourism Authority estimates the visitor count will increase to 20 million visitors annually over the next five years. Having seen many changes since I first traveled to Thailand in December 1999, Bangkok is rapidly modernizing. A monorail system called the BTS Skytrain travels above and through the heart of this city. Since 2004 a new MRT Chaloem Line subway with 18 stops covering 12 miles, including major areas, helps to alleviate traffic in this city of more than 68,000 taxis and hundreds of three-wheeled Tuk Tuks and motorbikes. First-time visitors to Bangkok should start with the Royal Grand Palace, comprising more than 50 structures, then head to the Reclining Buddha, a few blocks away, before hopping aboard a water taxi to the Temple of Dawn, also known as Wat Arun, across the main river, Chao Phraya. While still in this area, take another taxi to Chinatown, where visitors stop for lunch and shop for electronic and gold products. You can see what Thailand has to offer in natural beauty and wonderful parks by hiring a taxi to take you outside of Bangkok. 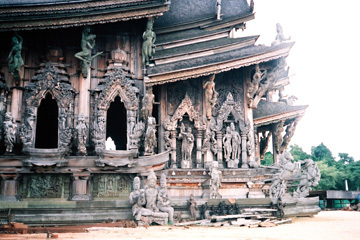 Consider stopping at the Ancient City, also called Muang Borang, 40 minutes south of Bangkok. Within this 320-acre park are 116 reproductions of palace halls, temples, stone sanctuaries, traditional Thai houses, monuments, statues, lakes, boats and waterfalls. To keep this place clean, no littering, pets, picking of flowers and loud noises are allowed. Those who break the rules are escorted out by security. Admission is $7. On the way to Bangkok, we stopped at the Erawan Museum. One cannot miss the gigantic, 100-foot-high three-headed elephant, also called the Elephant of the Universe, standing on the oval building. After walking up the stairway inside the museum, it's a short elevator ride through one of the elephant's hind legs to get into the body of this huge structure housing a temple with statues of Buddha. The body of the elephant can easily hold 40 people, while the museum holds many priceless objects of art. The museum is surrounded by a botanical garden with pool and waterfall. In the main walkway, young Thai girls perform their cultural dances. Admission is $4. The Sanctuary of Truth Wooden Building in Pattaya City. From Bangkok it is a two-hour, 90-mile trip to Bangkok via an air-conditioned public bus that costs 90 baht ($2.30). Pattaya has about five miles of beach and more than 80 hotels. In the evening, part of the main street is closed, making room for the crowds hopping from bars to nightclubs. On the dock side of the streets are many great seafood restaurants offering fare at reasonable prices. Fifteen miles from Pattaya City is the 70-acre Million Years Stone Park and Crocodile Farm, a must for any visitor. It is a living museum featuring gigantic white rock formations surrounded by award-winning bonsai trees, a garden of rare trees and colorful flowers, and a waterfall. In one section of the park, there is a pond where one can observe catfish the size of humans. An animal zoo is also part of the park. Here, one can sit next to a large tiger, stand next to a bear and, if brave enough, sit on a live crocodile while holding its jaw wide open. I did take this risk twice and most likely will never do it again after observing my croc bite its trainer. While tourists might assume the crocs must be tame to be in a tourist park, they are still dangerous wild animals. Admission is charged. Our next stop was the Mini Siam Park. We arrived just before sunset when the lights are turned on for night viewing of large replicas of famous world structures such as the Eiffel Tower, Buckingham Palace and Mount Rushmore. 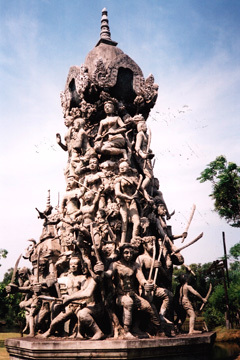 The park's other half features miniature versions of 56 replicas of famous Thai temples, statues and monuments similar to those at the Ancient City. Nearby is one of the largest jewelry stores in the world, the Gems Gallery. Upon entering this building, one is taken on a monorail ride for an amazing journey of lights and glittering gems. Getting off the ride, one enters an area where craftsmen work before being escorted into a large showroom full of rings, pendants, necklaces and other jewelry. Heading back to Bangkok, we stopped at the Sriracha Tiger Zoo, home to more than 200 tigers and the city's only female crocodile performer. It was amazing how long she left her head in the crocodile's mouth, giving visitors lots of time to photograph this dangerous stunt. We took in the tiger performance, just like the old-time Clyde Beatty animal acts, at an adjacent arena. 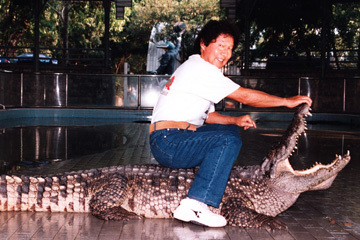 Author Tom Sugita braved sitting on a live crocodile at the Million Years Stone Park and Pattaya Crocodile Farm. He said it felt like sitting on cobblestone and it's not an experience he'll repeat after seeing the croc bite its handler right after this photo was taken. A Thai Airways flight took an hour and 10 minutes, and upon arrival in this city of 1.5 million people, we were greeted by the hotel shuttle for a two-night stay at the Imperial Mae Ping Hotel. This is a place to spend time relaxing after the hectic pace of Bangkok. The hotel was just a block away from the famous Night Bazaar and offered a great view of the region's mountains, at a cost of $45 a night, including a buffet breakfast and all taxes and fees. The next day, we hired a private taxi for $25 for a visit to two paper and umbrella craft centers, two teak factories, a large silk factory and silver, leather and wooden ornament manufacturing outlets. Seven hours of touring left us hungry for dinner at Fuji restaurant at the Chiang Mai Central Plaza. The grounds of the Ancient City, also called Muang Borang, hold reproductions of palace halls, temples, traditional Thai houses, statues, monuments, waterfalls and more. Hotels throughout Bangkok and Thailand are very reasonable, with a large room available at rates of $25 to $60 per night. Two of the top 10 hotels in the world, the Oriental and Peninsula, are located on the riverbanks of the Chao Phraya. If bargain-hunting for hotels, try visiting the Web site www.hotels2thailand.com for discounted rates. Many three- and four-star hotels offer rates from $30 to $60, depending on the season. These prices include all taxes and fees and daily buffet breakfast. Try to get a hotel near the BTS Sky train monorail or MRT Subway to speed your commutes. Increasing street congestion means you will get you caught in heavy traffic by relying on taxis. There is no better place than Bobae, in Bangkok, for picking up quality goods at wholesale prices. One way to get a bargain is to buy goods in minimums of half or full dozens; otherwise, you get charged the same price for buying one or two pieces. Street vendors do their morning shopping here and peddle their merchandise on the sidewalks of Bangkok. Shopping at Pratunam on Sundays when wholesalers bring out their goods is the second-best place for bargains. Another popular place for visitors and locals is the Chatuchak weekend market, open on Saturday and Sunday, with inexpensive wares that might not be worth enduring the humidity and elbow-to-elbow crowd. 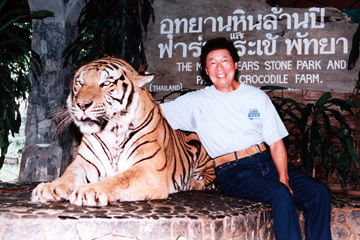 Visitors to the Million Years Stone Park and Crocodile Farm outside of Pattaya can also pose with a live tiger, as Leeward Oahu resident Tom Sugita did. Like our local Zippy's food chain, Thailand has a chain of MK Restaurants with 197 and counting, of which Bangkok has more than 100. These restaurants specialize in shabu shabu and dim sum. Buying the mixed vegetable plate, with more than eight varieties of greens, is enough for two, is healthy and costs only 165 baht ($4). Adding a side dish of meat, chicken or fish will cost each person about $1 each and is very tasty. My favorite places to eat are in Bangkok's Chinatown, home to hundreds of great restaurants. One that specializes in shark fin soup is Chinatown Scala Shark Fin Restaurant, a clean, modern and air-conditioned place where a small bowl, about 2 1/2 cups, is pricey at 500 baht ($12) but is probably the best of the five other places where I have tried this dish. Get the ones with crab meat added. Other favorite spots are Shangarila and NUN. If seafood is your choice, you must try the largest Seafood and Market Restaurant, the size of a football field, located at Soi 24. The restaurant's motto is "If It Swims, We Have It." More than 60 cooks are employed here, and one can view them at work just left of the entrance area. Three of us shared five dishes at a cost of $48. You are also charged a cooking fee for each dish, but the food is great and the cost is still reasonable by American standards. One warning: Unless you crave lobster or abalone, try to avoid these items. They are very expensive, even by Hawaii standards. At one restaurant, a medium lobster alone cost $85, and at another, abalone with mixed vegetables cost $30. Trying to impress my wife on her second trip, and struggling to cram as much while in Thailand, was an impossible task. It will definitely take her another return or two for her to truly experience the beauty and wonders of this kingdom. Tom Sugita is an adventurer who lives in Leeward Oahu and just returned from his 13th visit to Thailand. His life's philosophy is life is short and we need to experience and see more.